A low calorie, natural nutritional boost that helps enhance energy levels throught the day. 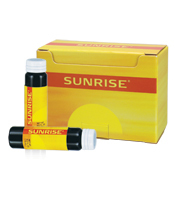 Sunrise herbal ingredients are harvested while their active components are at their peak. Key ingredients include lycii fruit, Chinese ginseng root and white cornel fruit. Be the first to review “SUNRISE” Click here to cancel reply.